Join hundreds of GAY Men for this years National Gay Men’s Health Summit, August 25-30, 2010, in Fort Lauderdale, FL. Lots of workshops, information sharing, and activites/dinners. FREE for residents of Miami/Dade, Broward and Palm Beach Counties! There are about 18 of us guys from the Group who will be going on the cruise. So sign up now and join in the fun. Chances are you will have a bunch of friends onboard — if not you make some great new ones! The L.I.F.E. Program® is the nation’s leading health-enhancement and wellness-counseling program for people living with HIV. L.I.F.E. provides participants with the knowledge, motivation, skills, and support necessary to establish and maintain health-protective routines. For more about Shanti’s Life Program, check out their Web Site. 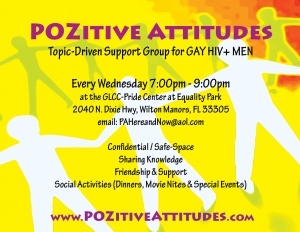 In Fort Lauderdale, the LIFE Program is provided by the PALS Project. Get Started with LIFE today!